Does Subaru use "special" oilfilters? Our Legacy needs a oil change soon. I was told by the Subaru garage that Subaru uses a special oil filter. I think he said that just so i would by the filter from him..
Re: Does Subaru use "special" oilfilters? I could order online, but then its the shipping.. 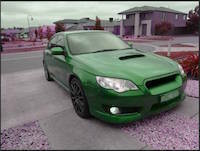 So if i can use non orginal subaru filters thats great.. Much easyer and quicker to get. Is this a trick question?? Seems pretty clear to me?? PS. Ordering online coupled with some other service parts, can save quite a bit of $$. P.PS. Wow. Buddah has been making kind of helpful posts lately! Last edited by alexeiwoody on Mon Oct 20, 2014 7:27 am, edited 1 time in total. PS You forgot to tell us how much the ferry trip is ?? You wonderd why i dint just go buy a subaru filter.. I can, but since you ask, the ferry cost about 22$, each way.. So if i can drive for 10 mins thats alot cheaper and quicker. Anyway, im buying a mann filter or something. I dont live in a shithole, apparently i live in one of the worlds most beautiful countries. Judged by the tourists..
And on this small island i live on, i dont know how many schools we have, but its more then 10. Thanks for the tip bigBADbenny! We actually have a Mazda dealer here..
Buddah he doesnt live in Tasmania. You dont contribute, please stop posting. I recall something about the subaru filters having an anti drain back valve. I had someone dismantle my oil filters a few times and they asked me why i insist with the genuine one's when other aftermarket filters also have the anti drain back valve. Possibly check to see if the brand you are looking at has an anti drain back valve. called it pressure limiting valve or something.. I might mix the words now, but it said something with a valve..
No i dont live in Tasmania, Norway is my home. Anyway, thanks for your help and tips!